There are 3 reviews of 1 Iris. Beautiful iris-centered portrait by Prada in their "Les Infusions" series. This is a floral-woody masterpiece that does the iris note justice. Smells pure and dignified, never overtaken by the flurry of other notes surrounding the iris. It has that slightly sweet, powdery, and tastefully floral edge that is deeper in my perception than Prada's Infusion d'Iris. Great casual fragrance for every day work and play! I love this scent, I would just call it an every day perfume. Light, but not too light, good Iris note. I find myself always going back to it again and again, so I must like it, and I am kind of a perfume junkie. 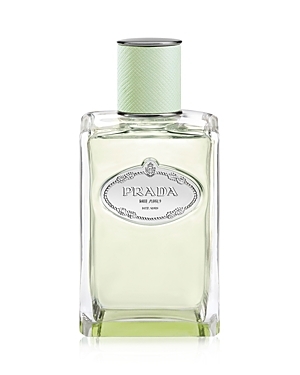 Prada No 1 Iris is a soft, slightly sweetened and powdery iris soliflore. It does resemble the Infusions a little bit, but the iris is fuller, richer, more nuanced. There is a distinct carrot-like air and an earthy rootiness which is softened and dried out by the slightly powdery and sweet base. This is a beautiful, warm and wearable iris on the cozy end of the spectrum compared to Serge Lutens' aloof and mentholated Iris Silver Mist. Prada Les Infusions Iris Eau de Parfum 3.4 oz. 1x PRADA IRIS CEDRE Eau De Parfum mini Perfume, 8ml, Brand NEW!! 1x PRADA IRIS Eau De Parfum mini Perfume, 8ml, Brand NEW!! There are no member images of 1 Iris yet. Why not be the first?